I have a Zenith Z50PX2D. If I send you both modules (Y-sus and Z-sus), could you verify which one is defective, do the repair and return both back. (so I only have to pay for 1 repair) ? We often get asked similar questions and although I've touched on the subject previously, I'll answer this one direct and forward similar questions to this post in the future. There are several things I want to cover, but I'll start with the answer to the question asked: yes, you can always send both sustain boards and let us determine which one is bad and service only that one. However, you'll have to pay us for testing the other sustain board is working good and that is often a waste of your money. We bench test every single board that gets into our service facility and that bench testing helps discover apparent problems and thus save us the time and effort to put the board in a real set. If all bench tests pass OK, though, we must put the board in a set as this is the final and ultimate test. Sometimes they pass it and other times they do not. So one, it takes time to make certain a board works good and that time needs to be paid. As the enumerator in the above sentence suggests there's more to it than just time. Sometimes the board turns out to be defective or may fail while testing. Rarely, but when you do hundreds of them per month rare changes its meaning. Suffices to say it happens more often than we'd like. So when it happens it can burn another board - whether because the one we're testing is malfunctioning or just failed; for example a malfunctioning Y-Main board may easily kill a buffer board and a failed sustain , either ZSUS or YSUS, can sometimes kill the power board. Meaning two, there is a certain statistical risk in testing boards and that also means extra cost. Last but not least, there is also a pure human factor risk in operating, which is different than time and different than statistical risk of coming across a failed board or a board that decides to fail on you. We all do mistakes sometimes and the more we work with something the more likely it is to happen. So three, there's the human error factor that needs to be shielded. In summary, this is why we (and everyone with any brain) need to charge for a simple test of a working board. As I've pointed out many times before, some modules have particularly limited life span. In our case, the Y-sustain and Z-Sustain boards in Zenith Z50PX2D fall in this category as all other modules in the TV easily outlast them. If the two boards have similar life span (which is normal to assume since they use the same components to perform very similar functions on both sides of the plasma display panel) then it stands to reason that one should expect them to fail shortly after each other. There are no two completely identical objects in the universe, though, and if there are they aren't being treated absolutely equally by the rest of the universe, so they can't be naturally expect to fail at the exact same time, or even by the exact same time difference. So what's the value of knowing that one such board is "working" when the other isn't? It can fail on the next day or the day after or a month later. Maybe a year later although if they have been rally side by side from day one I'd say it is much more likely to be within several months than within a year. Don't forget we have to charge you for telling you that it works now. So how would it feel if it fails three days from now? Wouldn't that be wasted money?! For the record, we're OK doing it either way, as long as the customer understands the risks involved. In my experience very few do. It is important to point out that while YSUS and ZSUS in all plasma TVs have very similar functions and often times similar implementation, it is not technically correct to assume that they necessarily have the same lifetime. Sometimes the YSUS and the ZSUS are actually implemented differently and other times external factors may be causing the failure and it may only be affecting one of the boards. This is most commonly the case when a buffer board fails and causes damage in the YSUS. Not all TVs have that problem either, so there's no golden rule that works in all cases other than "buy a new TV". then the above considerations definitely apply to you as those tend to go bad in pairs. ON HAVING FAILURE SYMPTOMS "EXACTLY AS DESCRIBED AT MANY SITES"
Hope that doesn't sound like picking on potential or current customer, but the Internet is so full of sh*t you'd be better off quoting it anyway. People (including me) often assume that what they've experienced once or twice or three times represents general trend and formulate their experience as a general trend. For example "the most common cause of the failure is the Y-Main board" [because my Y-Main has failed or because I've seen two, maybe three in a row where it failed]. Or "I opened my TV and didn't see any bulged caps on the power or sustain board". Well yeah, you won't because that's not what goes bad in your particular case even though Internet is full of people and cases where bulged capacitors were the problem. To make things even better different failure syndromes (depending on how described) can be caused by completely different reasons. 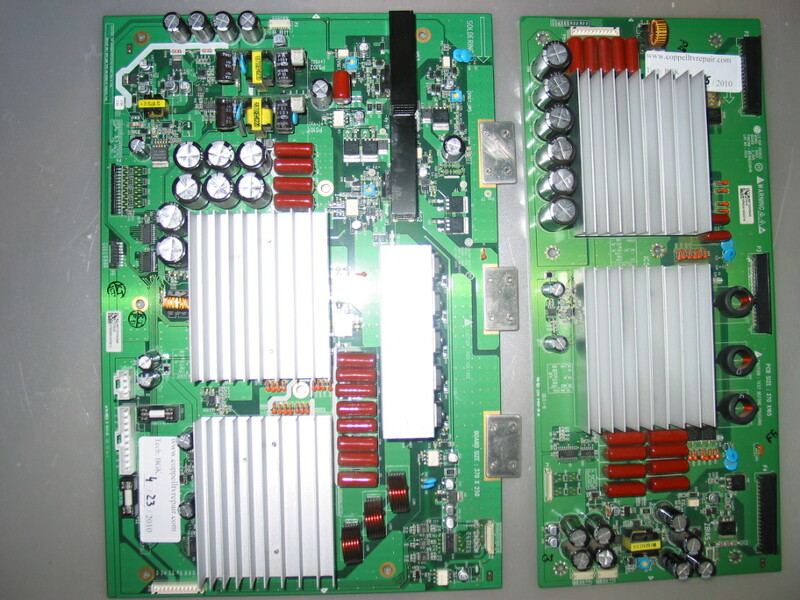 A short on either YSUS or ZSUS board would cause the same automatic shutdown that can also be caused by a randomly failed power board or main board. A failed YSUS board in one TV could result in completely different behavior from the one failed in another TV of the same model. Say on one they used Y-Main boards with IPMs from LG and in the other they used Y-Main boards with IPMs from Sanyo. One would fail with a loud pop (maybe, most of the times anyway) and the other will go so quietly you may never actually notice it. One may result in a dark screen, the other - in blinking. It's the same failure (well almost), but two very different experiences and indications. One can navigate through all of that on their own, of course....just as one can change their oil in the car, for example. Most of the people - again including me - have their oil replaced by someone who's maybe not smarter, but definitely more efficient doing it. Efficiency is a good thing. 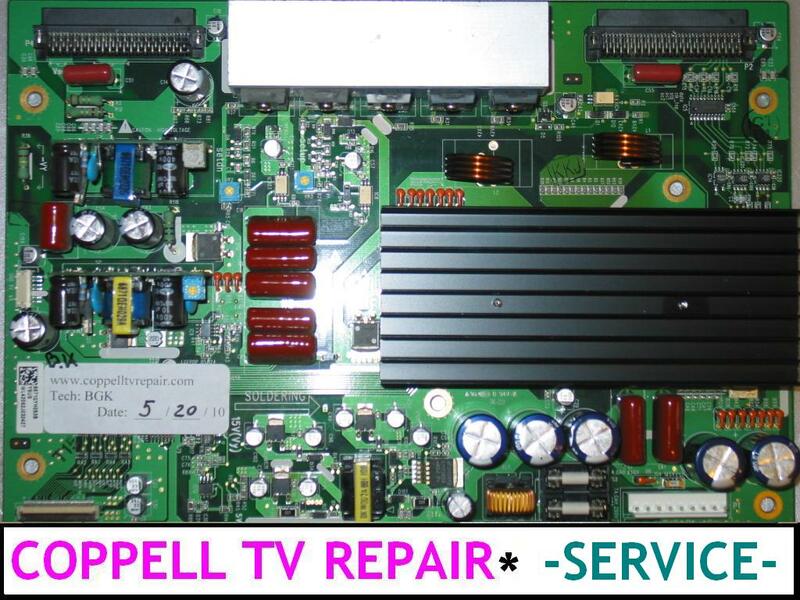 Should I replace one or both sustain boards in my plasma TV? How to identify failed sustain board for HP PL4260N?